The simple design and vivid color patterns of this exquisitely produced lamp are impressive. Instead of the usual metal slotted top this lamp features a slotted ceramic black top. 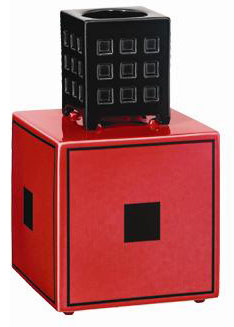 The Secret Box is produced for Lampe Berger by Longchamp. It comes in a Lampe Berger gift box with a burner, funnel, and instructions. This is a beautifully finished lamp.